I’ll teach a sourdough starter webinar on Wednesday May 3rd from 4 pm to 4:30 pm Pacific time. You can watch it directly from my webinar page. Open the webinar up in YouTube and ask me questions in real time through a chat window you’ll see to the right of the video. If you can’t watch the webinar live, return to the webinar page later to view. YouTube will automatically record the live stream. I work in publishing and with non-fiction books, after you have compiled enough revisions, you put out a new edition. With a blog, you write a new post. But you can’t delete the old post because you’ve linked to it all over the place, people may have bookmarked it and you have noticed how that post attracts steady daily traffic so you just add more posts until your blog grows unwieldy, just like a sourdough starter if you’re not careful! My sourdough starter Eleanor turned three years old this year. I meant to throw her a party but I was awfully busy that week. Since her birth (February 10th, 2014), I’ve changed my technique slightly. As with parenting, you learn as you go. I feed my starter room temperature water. I used to heat up water to about 100 or 110ºF to feed my starter. But visiting my daughter recently, I noticed she skips this step when feeding her starter (Eleanor’s offspring). I’ve made this small change too. The less energy I consume, the happier I am. I always have a jug of water out on the counter to use in ferments so I now feed that to Eleanor. I maintain a much smaller starter. My previous posts called for feedings of 100 grams each of water and flour for every 2 to 3 tablespoons of existing starter, following Michael Pollan’s recipe in his book Cooked. Today I mix 40 grams of water and 40 grams of flour with about 1 tablespoon of starter. When I feed my starter, I have just enough discard to make a couple of pancakes, which I eat several mornings a week. These smaller proportions prevent my pile of discarded starter from growing into the blob that ate my kitchen. If you need more starter for something like pizza dough, just increase the proportions of the feedings. I feed my starter quite a bit of rye. I used to feed Eleanor equal parts whole wheat flour and white flour. She prefers rye over whole wheat (picky toddlers…) so I feed her about 25 grams rye and 15 grams white. I don’t get too hung up on the rye-to-white ratio of my 40 grams of flour. I just add more rye than white. I make only as much leaven as I need. In the past when I baked two loaves of bread, I first made a large leaven consisting of 200 grams flour, 200 grams water, 35 grams starter and 25 grams salt. After the leaven rose and fell over a period of about 10 hours, I would add half the leaven to my dough and use the other half as my new starter. But that takes me back up to the larger starter (100 grams each of flour and water) that I want to avoid making. So these days, I make a leaven half as large. The entire thing goes into my bread dough. In the background, I have my smaller starter and I continue to feed that. Sourdough crackers. Old starter makes for a tangy cracker. These taste cheesy but contain only discarded starter, flour, oil, salt and baking powder. You can find the recipe here. Sourdough waffles. These too work well with older starter as you add fresh flour and let the sponge sit overnight. That feeding perks up the old starter. Find that recipe here. Sourdough pancakes. The easiest recipe of them all. They work best with discarded starter that’s a bit younger, let’s say a couple of weeks old at the most. Get the recipe here. Soft sourdough pretzels. These work well with discard that is only a couple of days old at the most. Cheat and add a little commercial yeast. Here’s the recipe for these. In workshops, when I show people how to start and feed a sourdough starter, they often say things like “It sounds like ‘Who’s on First.’ Which is the discard and which is the starter I’ll use next time and why do I have to remove so much to feed it and why do you make it all so confusing?” I hope people find the instructions below more straightforward. Remember to take notes as you embark on your sourdough adventure. You will feel terrible later if you forget the details of those early milestones, like what type of flour you used in the first loaf your starter made. In the video above, I demonstrate how to make a sourdough starter and how to feed it. Combine flour and water in a glass jar or bowl. Use a utensil or your fingers. The starter will have the consistency of thick pancake batter. Cover with a cloth, a plate or lid. Set in a warm but not hot spot. Stir daily several times when you think of it. In the dish that you started your sourdough in, you now have a tablespoon of starter remaining. Add to this fresh flour and water—40 grams of each. Stir, cover with a cloth or lid and set aside. Continue to feed your starter daily and described in the previous two steps—remove most of the starter, add that to the discard pile in the refrigerator and feed the remaining tablespoon of starter fresh flour and water—40 grams of each. After about five days to a week of feeding your starter regularly (daily or even twice a day), it should double in size within about four hours of feeding before slowly falling back down. Congratulations, your virile starter can now bake bread. Think of a cute name. If you want to take a break from daily feedings once your starter is established, store your mature starter in the refrigerator and remove it about once a week to feed it. Let it sit for a couple of hours after feeding before returning it the refrigerator. Thanks for this update! 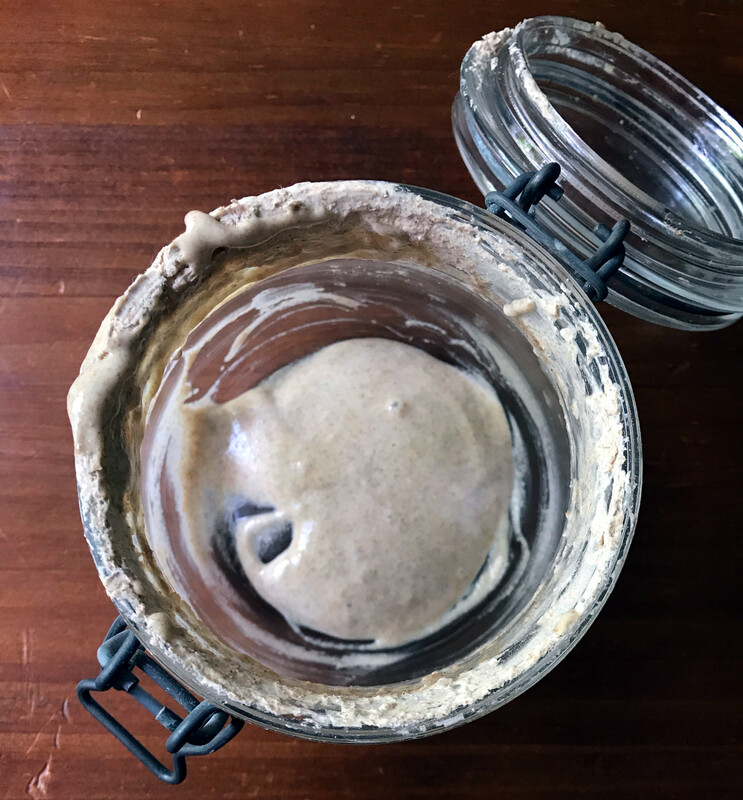 I’m definitely going to try to make the webinar as I’ve always been a bit intimidated by sourdough starters! I was lucky enough to be given a well established starter by a friend a couple of months ago. I had always been put off trying sourdough because it all seemed a bit complicated and to be honest, so far I have only made pizza dough with it because it is the best pizza dough I have ever had. I keep mine in the fridge for most of the week, then take it out and feed it two consecutive days – the discard from those gives me enough for the pizza. Now I have to branch out into bread & crackers….. I was also given an established starter a few years ago. I am admittedly quite lazy with it – I feed it when I know I’ll be using it, otherwise,it lives in a jar in the fridge. They are pretty hardy creatures – mine goes through months of neglect (in the summer when it’s too hot to bake), but during the winter, it gets quite a bit of attention. It’s never been too hard to bring it back to life, although the discard I pull off when it’s sat too long ends up in my compost bin. Thanks for the info, Becky. That’s good to know you can leave it for so long unattended. Hi, I am trying to make sour dough starter for the first time. Thanks for the step by step directions and for your video. I think my starter is ready but the part I am not sure about is that it has not fallen back down on it’s own. When I fed starter today it had risen quite a bit so I think it is ready. Should it be falling back down on its own or with my help when I stir it? 🙂 Thanks. I’ve been feeding the starter daily as suggested for about 5 days now but still only a few bubbles and no rising. I’m using 100% white bread flour, 40 g of flour and 40g water. Am I being impatient and should just keep going? or possibly add in some rye flour? Your site has been my bible as I continue to shift to low-waste, no processed eating so thank you! I’ve never made sourdough before and I’ve started a couple of starter experiments the last few days. I read about using kefir in starter, so I used 40g of homemade milk kefir instead of water and added that to 20g whole wheat and 20g white flour. After 12 hours, it had bubbled and more than tripled in size… smells yeasty and amazing. Do you have any experience with this type of starter? I think I might just try to feed it tonight and see how it does? There’s so little info on this online, I thought I’d check with you! I just can’t believe how quickly it activated, compared to my flour/water starters, I don’t want to feed it or jump to baking sooner than I should. I’m trying starter for the first time with your 40/40 measurements (used rye and white flour). I even took your advice and named her (Meredith) and she did great … got some bubbling within a couple of days, started feeding her 1-2 times a day, and she was rising well. Two or three days into the feeding, I decided to move the tablespoon of starter that I was keeping into a fresh bowl (thinking the old one was getting manky) … and she died. There was a little bit of bubbling the first day, and I fed her, and then nothing and she went mouldy. So I tried again using some of the discard from the fridge (Meredith 1.1) as well as a batch from scratch (Meredith 2.0). The stuff from the discard bubbled a little bit and I fed it, but then it petered out like the original one. The stuff from scratch had a few bubbles last night but I decided to wait until this morning to start feeding her, and this morning there was mould around the edges of the bowl. I’m assuming I should have fed her last night rather than waiting. Any suggestions (other than the obvious thing that I just need to try again)? Do you really keep the starter in the same container all the time without washing it?? It would seem like that would get pretty icky after a while. Or is there something different you need to do if you’re trying to revive the discard stuff? Or is there a way of “rescuing” the starter if the mould is just at the edges? 4 says ago I started to make a starter but I missed one seemly important step. I neglected to pour off some of the starter every day and have just been adding the water and flour everyday. It has been bubbling but tonight it looked less bubbly. Can I salvage it by pouring off half tomorrow when I add the water and flour? Pour off the water layer? Hi, thanks so much for this post and your blog. I’ve just started my adventures in sourdough starter and have so many questions! I’m especially happy that you have vastly simplified the maintenance in a way that my brain can digest. Despite a bumpy beginning, I now have an active starter and am starting the twice-daily feedings to get things really going. My question is this: when storing the discarded portions in the refrigerator, should this be stored in the same type of non-airtight container as the active starter? starter adventure using your 40/40 recipe (after a few unsuccessful attempts with other recipes in the past). I’m up to day 3 and this morning noticed my sourdough was quite runny and appeared almost flat (only very small bubbles) and greyish in appearance, but no distinct water… Yesterday it was very bubbly and much more thick before I discarded most of it and subsequently fed it 40g each of flour and water. You seem to know a lot about sourdough, so any tips you may have would be greatly appreciated. Thank you! Can you make a starter out of Gluten Free flour? And if so can you suggest what type of flour I could use please? Thanks for the link – I’m off to see if I can make it happen! Have a great day! This is incredibly helpful information! Thank you! You are a lifesaver. I felt so bad to waste too much dough every time I had to feed my starter, and your tutorial helped me understand I didn’t really need to keep a lot of starter. Thank youuuu! Anne Marie, I am a huge fan! Thank you for being so generous with your ideas, recipes, and knowledge. I have a question that I’m hoping you can help me with. I’ve been baking sourdough bread with einkorn flour for several months and have made some yummy loaves but think I might be overcomplicating a step. Everything I have read says to use freshly fed starter. What I’ve been doing is feed my starter in the evening or morning and then use it the following day to make a loaf. Is this correct or should I literally feed the starter and make the leaven immediately? I really appreciate your help and all the best! I used 25g whole wheat, 15g white, 40g water (all measured on a scale) and the mixture was almost much too dry, almost like very dry cookie dough. We added a bit more water (maybe 10g but I forgot to measure of course) to get it wetter and are going from there. Maybe different flours require different ratios of water/flour? The wheat flour was Red Mill stone ground whole wheat flour. Best piece of sourdough advice was to find some in your town that makes it and ask LOTS of questions!! X-) I was reading everything online. Bought all the equipment, distilled water, (expensive) organic flours. Never made a decent loaf. Asked a neighbor that makes it daily for her B&B and she had me up and going with my starter in two days of feeding it *bleached* (cheap) flour and hard water from the tap. Only thing I needed to buy was a glass jar from the Dollar Tree as I has my starter in a plastic container (that it did not like). I was in tears on day two when the starter overflowed the jar two hours after feeding. Tears of joy, of course. Anne Marie, I just found your blog today by searching for sourdough cracker recipes. I have been baking sourdough wheat bread daily for about three years now. I address the wasted-starter issue by switching to a solid starter; have you ever tried that? In the morning, I scrape out my entire starter jar with a silicone spatula, then to the dregs I add 38g white flour, 12g whole wheat flour, and 34g water. The <1 gram of starter left over in the jar grows like Topsy, and (after a stir at night) the next morning, I scrape out the entire contents (80g) to become the new leaven, add to 330g flour, 300g water, 3g salt, and mix up a new dough, which that evening I will bake into a small 16-slice loaf in a pan. No excess starter! If I go away for a weekend, I just refrigerate the jar and take it out the night I return. Hey Anne Marie! I have a question regarding the discarded starter, particularly the reason behind discarding it at all. If I were to feed the whole starter rather than discard 80% of it, would that affect the starter fermentation, or would I simply end up with way more starter than I need? Hi Anne Marie! Thank you so much for your posts. I am 5 days in to my starter process. Yesterday (day 4) I had some bubbles, pretty good rising, and a bit of a dry crust. I wasn’t sure if I should be looking for more bubbles so I stirred it, left it for the day. I didn’t see any more bubbles or rising by the evening so I fed it for the first time this morning. 12 hours later I don’t see any changes. As you mentioned, this is where I’m getting confused. Should I be looking for any bubbles or rising before I discard 80% and feed it again tomorrow morning? I’d love to know a bit about what is happening at a scientific level between the first feeding and when the starter is ready to make bread. I feel by removing 80% each time I am just gradually diluting whatever was creating all the good bubbles and rising I saw on day 4. What is happening through the daily discarding/feeding process that encourages the starter to eventually rise and fall within 4 hours? Are the organisms reproducing more and more quickly and after about a week they reach peak reproduction? I think this would help me understand the process better. I would wait until you see more bubbles before you feed it again. As your starter develops, the bacteria and yeast reproduce in there until you have enough to make bread rise. But they need food–the fresh flour and water. Have you read Michael Pollan’s book Cooked? He explains what’s going on in the starter. I hope that helps. Thanks soso much for everything you are sharing on your amazing site. Hope to start the new year with experimenting loads in this area 🙂 I’m guilty of finding this sourdough-craziness too complicated, but now I’m just thinking that I have to try! One thing I’m wondering and can’t find anywhere explicitly, do you use up the whole ready-for-bread starter and then start a new one all over again? Because I’ve heard of someone called Eleanor and I’m just not quite clear on the transition part from where it’s ready to use to an ongoing starter? Hope you get what I mean. Thanks! Hi Anne Marie – My sourdough discard is taking over my life. I have two containers stored in the fridge. One that is fairly recent, about a week or so old, another that is a couple of weeks old. I’ve made pancakes (great), crumpets (ok), crackers (fabulous) and tortillas (very good), but still the containers keep growing. Question. Can I use the old starter or should I discard it. I hate to waste it, but I don’t want to get sick either. It looks lovely …. Took your sourdough starter class in December and Maggie Mae is doing really well. Too batches of great bread, but it’s that discard – there are just two of us. I did your workshop on sourdough starter last year, tried once, it kinda worked, but then I put it on the fridge and forgot about it (ooops), and now I tried a little bit with rye and it super bubbled on the first day, but then after two or three days it got TOO funky, so I thought it would be best to discard everything… I don’t know how to keep it outside the fridge in the summer, since we usually have 28 to 38 degrees here and I don’t want to mess it up, but at the same time if I put it in the fridge, there is no activity. 🙁 What do I do? It will ferment quickly in that heat. Since it was in the refrigerator for a while, I would feed it a few times, twice a day (because of the heat) and then when it smells good and is bubbling, either continue feeding it twice a day or put it in the refrigerator and take it out once a week to feed it and then, if you won’t use it to bake, put it back in there after a couple of hours (after it begins to bubble up). If you keep the starter small (say, 40 grams water, 40 grams flour, scant tablespoon starter from previous batch), you’ll have less discard to deal with. Hi Anne Marie! 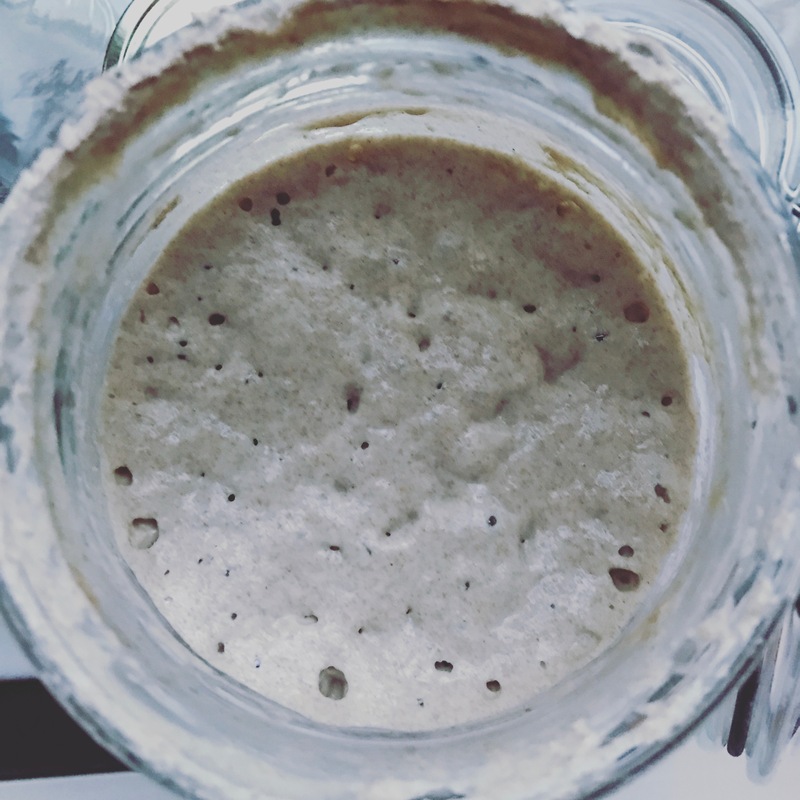 After months of reading up on sourdough starter (obsessing over it really – it’s so cool! ), I finally decided to try my own. The first time around, it developed mold. The second time around, I figured I started feeding it too soon (I thought it was bubbling on day 3 and so I started to feed it, but I think the bubbles was due to my stirring haha). I almost hit 2 weeks when I realized absolutely nothing was happening and that I should ditch it. I am hoping this third time is a charm… I am using room temp tap water (that I leave out over night) and unbleached AP flour. I’m on day 5 now and still only get a few tiny bubbles… From Day 1-3, the dough was really thick and almost clumped up into a ball when I would stir it. Starting Day 4, it got really runny and smooth. I know in your directions is says anywhere from a few days to a week is when I should see bubbles. Should I keep going or restart – maybe with a different type of flour? Any input is so appreciated. I appreciate all time and help you’ve provided others through your website/instagram. Thank you! Quick question: how long can you keep thé discarded starter in the fridge? I add the newly discarded starter to the one already sitting in the fridge from previous feedings, at the moment the oldest is from 1 month ago. Can I still use it?